The 'Rating Scan' feature runs a cloud-based assessment on files on your computer to assess how trustworthy they are. Bad - the file is unsafe and may contain malicious code. You will be presented with disinfection options for such files. Autorun: Indicates whether the file is an auto-run file or not. Malicious auto-run files could be ruinous to your computer so we advise you clean or quarantine them immediately. 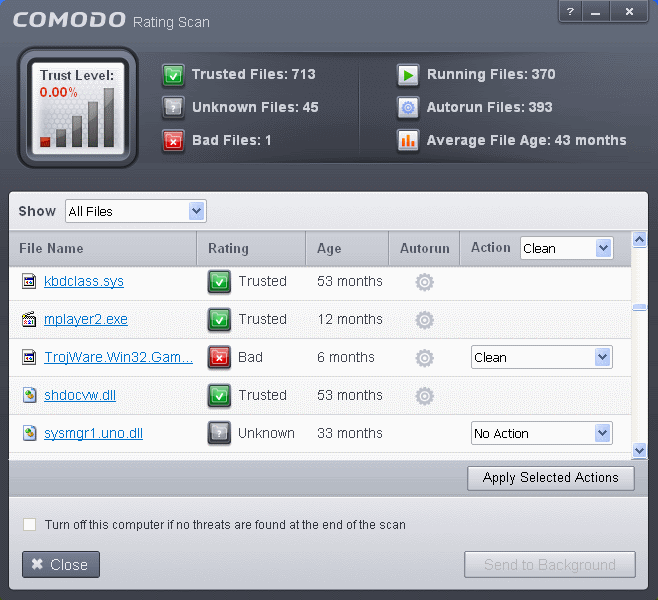 Clean	- If a disinfection routine is available for the selected infection(s), Comodo Antivirus will disinfect the application and retain the application file. 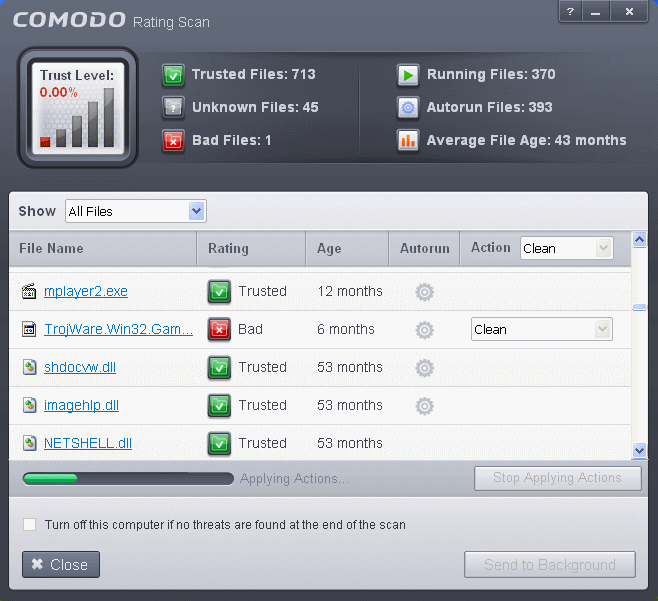 If a disinfection routine is not available, Comodo Antivirus will move the files to Quarantine for later analysis. See Manage Quarantined Items for more info. No Action - If you wish to ignore the file, select 'No Action'. Use this option with caution. By choosing to neither 'Clean' nor 'Trust', this file will be detected by the next ratings scan that you run. Trusted	- The file will be moved to Trusted Files list and will be given 'Trusted' rating from the next scan. For the same action to be applied to all	'Bad' files, make a selection from the drop-down menu at the top of the 'Action' column. … then click 'Yes' in the confirmation window.